3.73" x 4.02" x 0.73"
This item is covered by Newegg.com's Manufacturer Only Return Policy. Cons: IPD is fixed, and in my case not correct. So if your eyes are not aligned properly this will not work and there's no way to adjust it. So measure your IPD and check before you buy this. The downfall of this unit is no IPD adjustment. Other Thoughts: Well to start off with it is pretty sturdily built. It has a nice finish on it and the plastic doesn’t feel cheap. Overall it feels nice in the hands and is comfortable when wearing. Onto the setup; upon receiving this I connected it to my main GPU, a GTX1060, and the monitor to another GPU, an R7 360. Everything launched normally. until windows mixed reality said the headset wasn’t connected. I switched the headset to the R7 and it found the headset. Setup continues until it needs to download some more files. It failed 7 times. Each time after downloading for well over one hour. Windows support was of no help in the matter. After installing countless updates and reading forums it finally installed correctly. Only to tell me it will only work if the main monitor and headset are plugged into the same card. Overall I would recommend the headset but be prepared for hours of aggravation and seemingly pointless tasks. Other Thoughts: This is my first experience with VR so you can take what I say with a grain of salt. I have Incredibly good eyesight and this thing was making me second guess myself. WMR by itself is awful and clunky so that wasn't helping this thing's case either. The peripherals are blurry and there's no way to fix it. If you move something in WMR farther away from you it gets less and less detailed and aliases a TON making details unrecognizable. I don't know how to make it so what you a window on your desktop takes up the entire image of the VR screen but that's something I'd like to have done with this. I think all around windows needs to work on software for VR before I can truly have a good experience. I bought the headset on sale for $100 so maybe I'm being a little harsh. Bottom line is, this is a decent entry level VR. Nothing super spectacular about it but it will do what you want it to. Pros: Works Has potential for being awesome. Cons: This headset comes without controllers. Didn't think that would be a big deal until I tried to order some separately. NOBODY HAS THEM. I finally found standalone controllers on a well known old-school auction site, whose name I can't use here because rules. I hope they work, because nobody - NOBODY - sells controllers by themselves any more. Except that one guy. On the site-which-shall-not-be-mentioned-because-rules. Technically, these work with only an Xbox Controller. If you want use any other apps or games, you will NEED the controllers. Which you can't get by themselves. Except from that one guy. On the horrid, unmentionable site. Buyer beware. You can't return this if you got it on sale. Do yourself a favor and buy the bundle, or don't buy at all. Other Thoughts: Would not recommend. 13 out of 13 people found this review helpful. Did you? Pros: - The headset is very comfortable, not too heavy, and I can easily wear my headphones over it. - The visor flips up, which is great when you need to deal with something outside of the VR realm. - I need glasses, and the Lenovo Explorer has plenty of room that I can comfortably wear my glasses while playing. - It has a built in connection for headphones, if your headphones uses a jack, otherwise there is no issue with using your headphones plugged directly into your computer. I use a USB connection headphones without a hitch. - Steam has a specific WMR application that you can download for free, and the Steam VR portal is a room. I haven't explored the Steam room yet as I prefer the Windows version. - On Steam, there is ALSO a free piece of third party software that gives you virtual rooms in which to watch shows or movies, simulating a theater or a lounge or living room, etc, with the ability to invite other users into your room so you can both watch the show "together". I haven't fully explored this yet other than doing a little testing, but I feel it's a rather neat idea if you want to make sure distractions are blocked out. - You do not NEED to use the included controllers for many games. I use a PS4 controller for navigating inside the Virtual Desktop VR space (you can also use keyboard+mouse but I found this awkward as it doesn't feel like it was really designed with kb+m in mind). I can use my Thrustmaster HOTAS X while playing Elite: Dangerous in VR just as easily as I did while playing in 2D, and a controller would also work just fine. 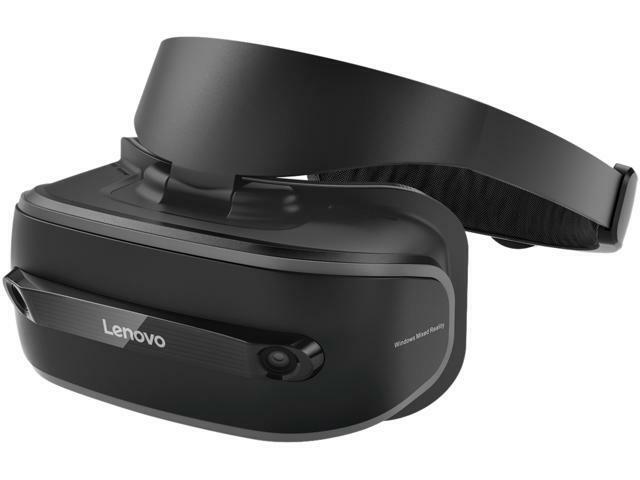 - VR is really something that needs to be seen to truly appreciate what it can bring to VR games, and the Lenovo Explorer is at an excellent price point- especially if you are able to find good deals, I only paid $230 for mine, which has everything the retail box contains, all still in plastic and film- so it allows people who can't spring for the more expensive HMDs to have access to VR. - It comes with a lens cleaning cloth, in case you get your grubby hands all over it. - The HDMI and USB3 cables are sheathed together into a single cord with several inches of split at the end, so there is only one cord trailing to your computer. As long as your HDMI and USB3 ports are somewhat close together, this should be good for most people. Less cord clutter is better. If you have headphones that can make use of the included jack, then you have even less clutter to worry about. - The headband is adjustable using a knob at the back, so it's less likely to accidentally change size. Once it's adjusted to your head size, it will stay that way. I currently have the Explorer set to launch the VR Portal when activated, and it will activate when I pick it up, turning on the visor and getting the portal ready. This can be turned off in options if you don't want it automatically turning on if you bump it. Cons: I had a couple of small hitches when I set mine up. - I had to update my USB3 drivers to use Windows drivers, which is easily done but may be difficult for the less tech savvy to figure out this is what is causing the Explorer to fail to initiate. - My Windows Update got a little weird, and wouldn't download the software from Windows to get the Explorer going, which required me to download a small application to flush Windows Update and kickstart it by repairing it. Once this was done, however, I was able to get the necessary updates. - It does have the "screen door" effect, which is more noticeable while in the Virtual Desktop, but I haven't found it to obstruct my view once I am in game. Sensitivity to this likely varies person to person. Once both of these were sorted, the Lenovo Explorer booted up just fine without further issue, and I have had no connection, display, or software problems since. - I do feel a little bit of eye strain after about 2 hours, but I'm not totally sure this is caused by the VR lenses being so close to my face, or due to the way the visor sits against my face, potentially causing irritation that feels like eye strain. Either way, a short break back into the real world eases the problem and I'm ready to go back in after a half hour or so. - Sometimes, typically when first launching a game, there will be some flicker between the game environment and an empty grey room (which shows the direction of "front" using an arrow on the floor so you can see if you're aligned correctly). I haven't noticed this happening once I'm past the initial first few minutes of launching and loading into a game. Other than these minor issues, I have had no further problem with the Explorer. Other Thoughts: I would recommend this product to people looking to get into VR with a lower price tag, and to people who would like to use the Virtual Desktop, or third party software for movie and video watching. I would absolutely purchase a Lenovo Explorer if I had to make the choice again. The only thing I can think of that I'd change would be some way to get the audio jack into a different position. Right now, it's held in place next to the HDMI/USB3 cord using a plastic "hook" and it can't be moved. I find sometimes it gets stuck between the WMR headband and my headphones headband, or gets pushed against my ear, etc. I can't move it or attach it elsewhere to get it out of the way. Perhaps a small inbuilt cavity that the wire could snap into would help. Pros: When working, nice imagery. Very comfortable, light weight. Cons: Glitchy product. Would work for a couple minutes the would start to flicker on and off, then completely go off. Tried to trouble shoot for hours to no avail. Had to return. Other Thoughts: Computer: VR Ready. Intel i7 8700, 16mg, Nvidia GTX 1080, 500gb SSD, 1 Tb. Pros: It costs too much for a controller without a product. Controllerless MRs are less useful. Cons: It costs too much for a controller without a product. 3 out of 29 people found this review helpful. Did you?